Since the current TIP/LIPM software all executes in locations 01FFF, the board maintains compatibility with current software. The format of the data to be downloaded is Intel Hex format. The file is currently sent over the RS-232-C port. The downloading protocol could be easily changed to make it use any format that was desired. One could even forsee downloading via the network. This would allow this modification to be useful to those who do not currently own a computer to do the downloading. I will try to have more details, schematics, etc, ready by the next meeting. Briefly, you throw away your 2708s and 2114s (anyone need some to build their board?) and replace them with a 2716 and 8 6116s. 3 additional MSI LS TTL chips are needed (LS74, LS153, and LS193). The only part of the modification that I am concerned about is the use of the OUTPUT ports. I'd like to talk to an 8085 hardware expert about this at the next meeting. Here is the verbatim text of the FCC order authorizing AMTOR. Section 97.69, Digital communications, has been rewritten apparently to clean up the wording. It appears to me that there is a problem in the new paragraph (a)(2) which states that the shift shall be less than 900 Hz. 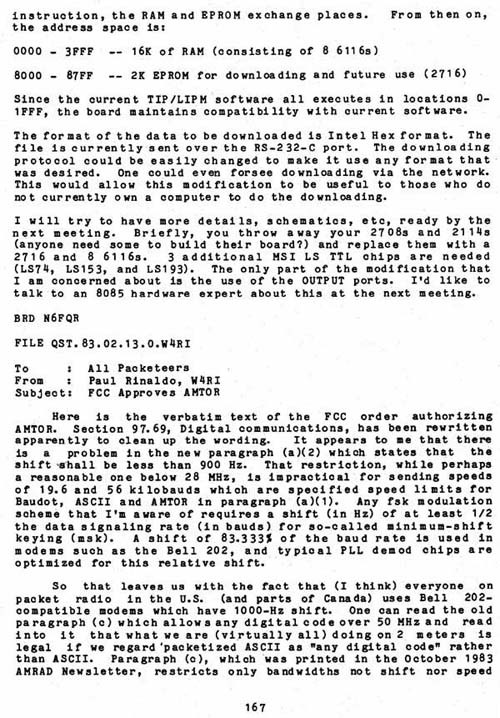 That restriction, while perhaps a reasonable one below 28 MHz, is impractical for sending speeds of 19.6 and 56 kilobauds which are specified speed limits for Baudot, ASCII and AMTOR in paragraph (a)(1). Any fsk modulation scheme that I'm aware of requires a shift (in Hz) of at least 1/2 the data signaling rate (in bauds) for so-called minimum-shift keying (msk). A shift of 83-333% of the baud rate is used in modems such as the Bell 202, and typical PLL demod chips are optimized for this relative shift. Click for Original Graphic Image of this page.